I’m not usually one to make cookies (much to Martha’s dismay), but when Cook’s Illustrated claims to have created “Perfect” chocolate chip cookies, the boast could not be ignored. Cook’s is based on perfecting recipes, but their claims are not usually quite so bold; more along the lines of ‘Ultimate Coq au Vin’, ‘Perfecting Berry Trifle’, and #$@%ing Awesome Hollandaise’. Simply ‘Perfect’ is a higher claim and an outrageous one, all the more so when made about chocolate chip cookies, a recipe with a thousand variations and everyone’s mother’s is the best. Such claims cannot go untested. A lot of people don’t like Cook’s Illustrated because they find their recipes a little too, let’s say, particular. I agree although am not bothered by it personally. This recipe for chocolate chip cookies was, however, atypically reasonable. There were no strange or overly fussy ingredients; just flour, baking soda, butter, white sugar, brown sugar, salt, vanilla extract, eggs and chocolate chips, with nuts optional. Just one kind of fat, no pastry flour and no need for vanilla beans. The one part of the recipe that seemed a little, well, precious was also the point of departure for this recipe, when it went from standard to superfluous cookies: browning the butter. After melting most of the butter, you leave it on the heat a bit longer until it turns golden-brown. It occurred to me just how brilliant this step was as my apartment filled with the rich smell of toffee. Another step seemed a little odd: after whisking together the wet ingredients, wait three minutes, then whisk for thirty more seconds, and repeat twice more. There are some who would balk at setting a timer and repeating this ritual, but in my experience resting batters and doughs can save mixing time, and it gave me time to do the dishes. I cannot testify personally as to whether you need to do this step, but I will defer to Cook’s. They test this stuff! The dough came together really beautifully, leaving nary a dust of flour un-moist. At this point, Cook’s suggests dividing the dough into 16 portions of 3 T each, either by measuring the individual tablespoons or with a #24 scoop. I decided I would out-Cook’s Cook’s by measuring the mass of my dough and dividing by 16, then using my scale to make portions of exactly the same size, by mass. I had 972 g of dough, which works out to 60.75 g per cookie. This makes pretty big cookies. They go in a 375°F oven for 14 minutes, rotated once in the middle of baking. They come out looking and smelling good. So, were they perfect? Without getting into all the implications of the word, these cookies are damn near close. Definitely the best chocolate chip cookies I have ever made. Nothing really stands out about the flavor, they just taste exactly like a chocolate chip cookie. What’s most impressive about these and any great cookie is the texture. The great cookie texture divide falls along people who prefer crispy cookies and those who prefer chewy. As I fall firmly on the crispy side, my first bite of cookie was a slight disappointment since the cookie was only chewy. I had made the mistake of breaking my cookie in half (for the photo, I admit) and taking my bite only from the center. For my next bite, I attacked both the edge and the center. And thus the genius of the ‘Perfect Chocolate Chip Cookie’ was revealed: the edge was crispy enough to satisfy my needs and, my crispiness needs sated, I was free to enjoy the chewiness of the center. A chewy cookie lover would be so happy with the center that they wouldn’t object to the crunchy give of the edge. This cookie managed to create a perfect harmony of crispy and chewy without compromising on either. 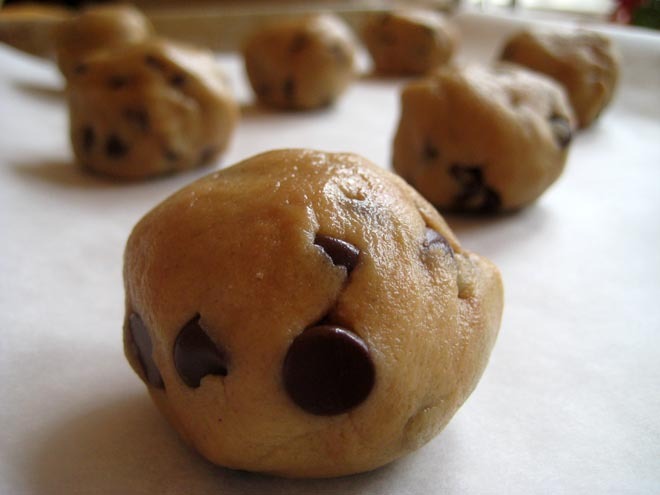 If that is perfection, then this was the perfect chocolate chip cookie. This entry was posted by Tom on Tuesday, May 5th, 2009 at 9:40 pm and is filed under Recipes. You can subscribe to responses to this entry via RSS. These were excellent. Let’s make them again! Some random person via twitter recommended a recipe from NYTimes published last year that apparently requires a 24 hour rest. Sounds like my kind of recipe! So that’s what I want to try next. I absolutely love this cookies. My aunt use to make them for me. I have her recipe, so i might share it sometime.